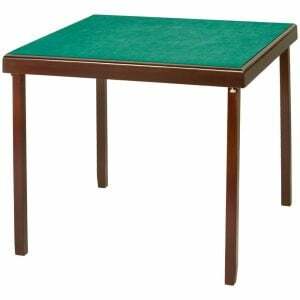 Looking for a pair of smart occasional tables to keep your card table clear of drinks and equipment? Then the Luxury Folding Side Tables are for you. When two are placed at opposite corners of your card table, they each serve two players and are fantastic for drinks. Consequently this helps to protect your cloth and table from accidental spillages. They’re also great for bidding boxes with room for the duplicate boards too. This helps to keep the playing surface clear for cardplay. The edge of the table top has a 1cm lip, which helps to keep everything in place (for extra protection you can cover the table top with our Eco non-slip matting) Not only are a pair of Luxury Folding Side Tables useful at the card table, they’re ideal as spare side tables when entertaining guests. Furthermore they make great pop-up bedside tables too. Those of you who know our business well, will know that we make all our bridge cloths in house. Simon uses one of these side tables for storing the iron and water spray next to the ironing board. He’s been using the same table for years and thanks to the durable mahogany lacquer, it still looks pristine. Made of a hard exotic wood, the mahogany lacquer co-ordinates with the colour of the folding wooden chairs, the Oxford card table and the Marlborough card table so that you can have a smart matching set. When folded, the size of each Luxury Folding Side Table is minimal, so easy to store when not in use. Dimensions in use : 37 cm x 28 cm x 55 cm high. Weight: 2.1kg.